While visiting Epcot today, my son and I decided to visit The Seas with Nemo and Friends. We were in the second level viewing area of the aquarium when divers began feeding the sea life. 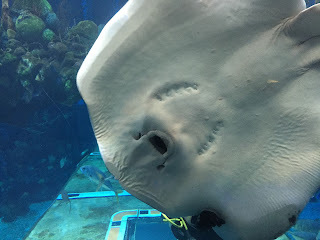 There are several rays that live here, but one of them is huge. This black blotched ray was led right up to the glass by a diver, providing an amazing opportunity to snap this shot of her underside. 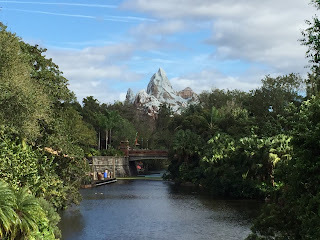 Last Saturday was "picture perfect" at Animal Kingdom. It was in the 60s and breezy, so the visibility was excellent. I took this shot from the bridge to Africa, looking down the Discovery River. 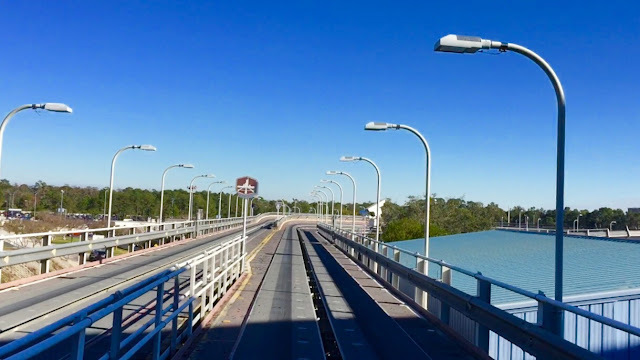 The tallest structure at Walt Disney World was looking majestic that day. 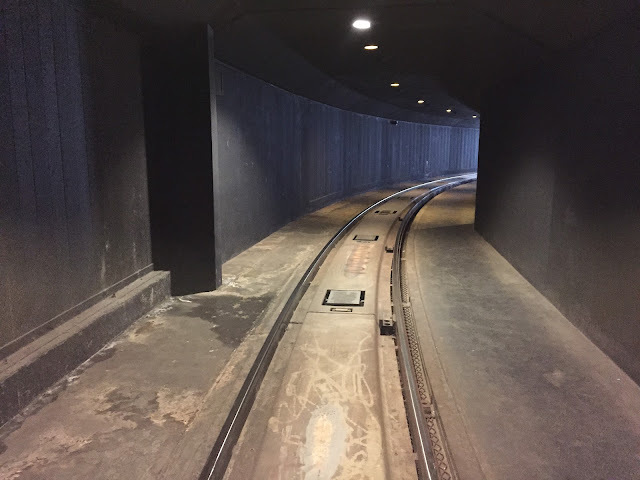 The Walt Disney World Railroad is used by many Magic Kingdom guests to get from one spot to another. 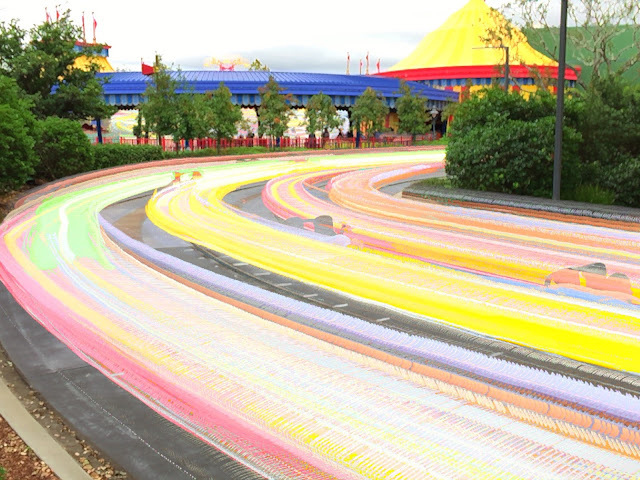 However, this ride around the perimeter of the park is really an attraction unto itself. The narration is fun and there are some great views along the way. 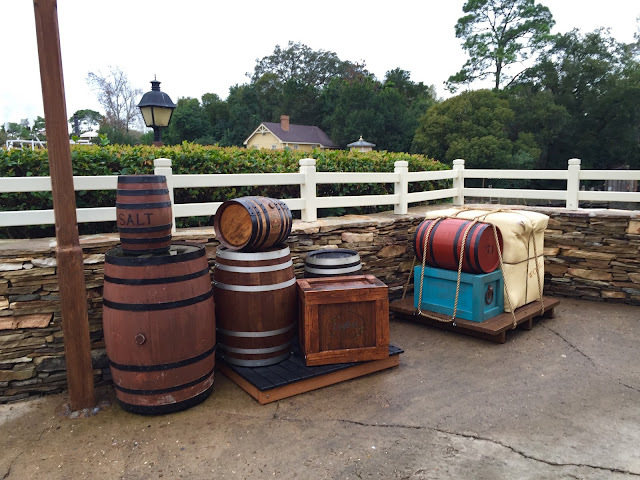 The best stretch for "scenery"can be found along the route from Frontierland to Storybook Circus. 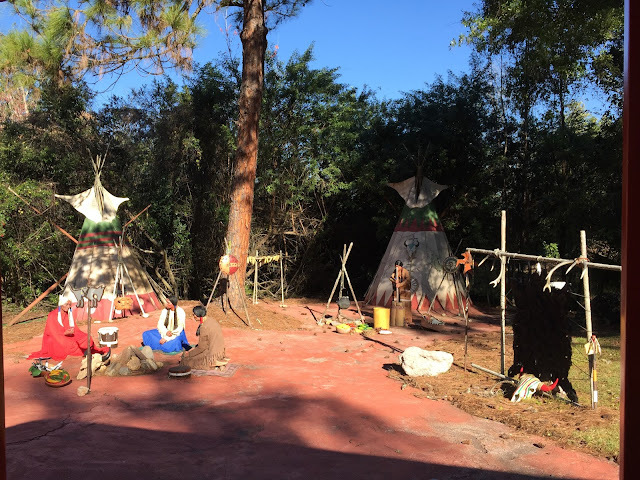 There are many animatronic animals from deer to alligators, as well as a Native American village. This a photo of the village on the left of the train that I shot yesterday. Today, I decided to try something I've never done before. For my birthday, I thought it would be fun to ride all of the thrill rides from all four parks in one day. I started with Seven Dwarfs Mine Train, and ended with Mission Space, 7 hours later. I also enjoyed Soarin and Test Track over at Epcot. Here is today's view on Test Track shortly after hitting the outdoor section of the ride. Muppet*Vision 3D is a classic attraction at Hollywood Studios. It was the last project that Jim Henson worked on, as well as the last time he voiced Kermit the Frog. 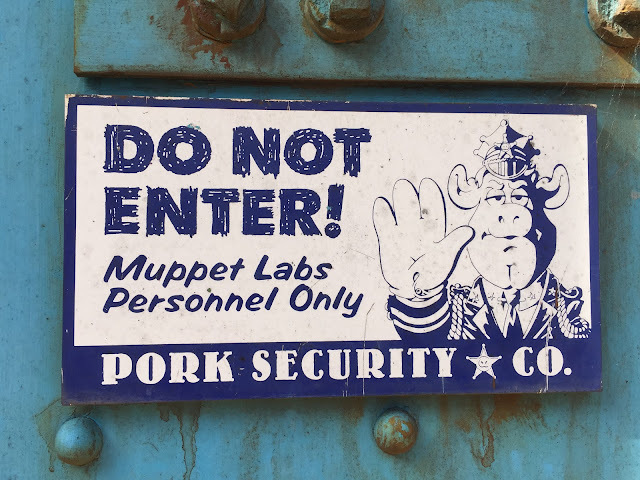 The whole area around the attraction is very well themed to everything Muppets, and there are funny signs and gags to be found everywhere. 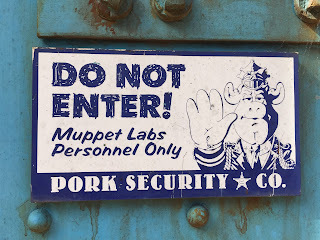 This sign would simply read "Cast Members Only" in any other area, but it has a little more "flavor" on this door! 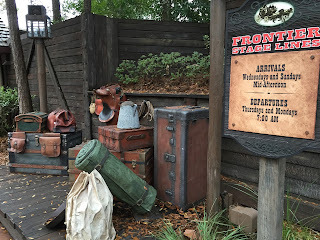 A few days ago, I found myself waiting for my tour guests near the exit of It's Tough to be a Bug at Animal Kingdom. The sun was on the other side of the Tree of Life, making for some fun photo opportunities. It created a silhouette look in the trunk, but gently illuminated the leaves from behind. There were many guests taking photos of the tree that day. As I've said in the past, this park is one of my favorite spots to take pictures. 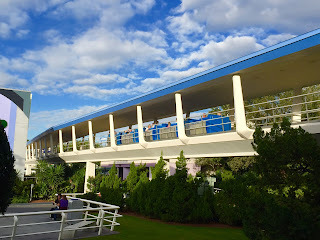 Early this evening, I rode the PeopleMover with my family. This has always been one of my favorite attractions, but the views were particularly beautiful as the sun was setting at the Magic Kingdom tonight. I snapped this shot of Cinderella Castle and the Rose Garden just before entering the indoor section containing the model of Progress City. 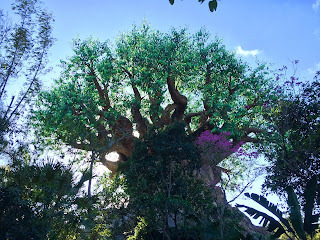 Today, I gave a tour at Hollywood Studios in the morning and Animal Kingdom in the afternoon. 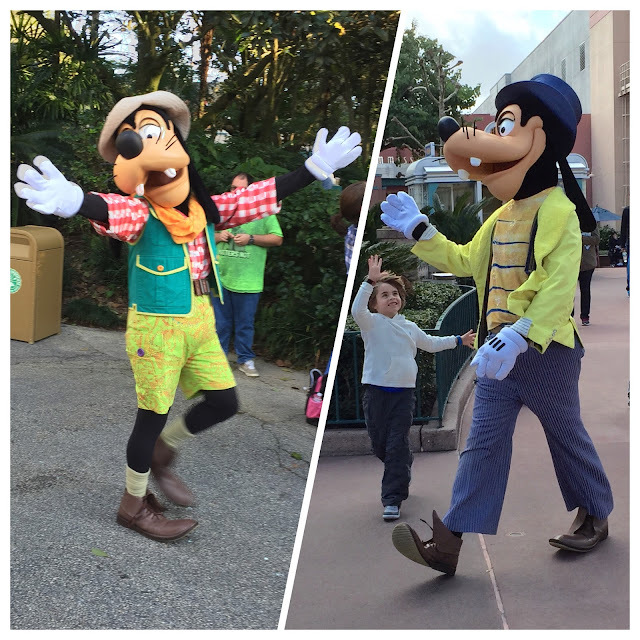 I encountered Goofy at both parks. He was wearing his movie star outfit at the Studios and his farmer getup when I saw him in Dinoland. It is fun to see different versions of the classic Disney characters throughout Walt Disney World. 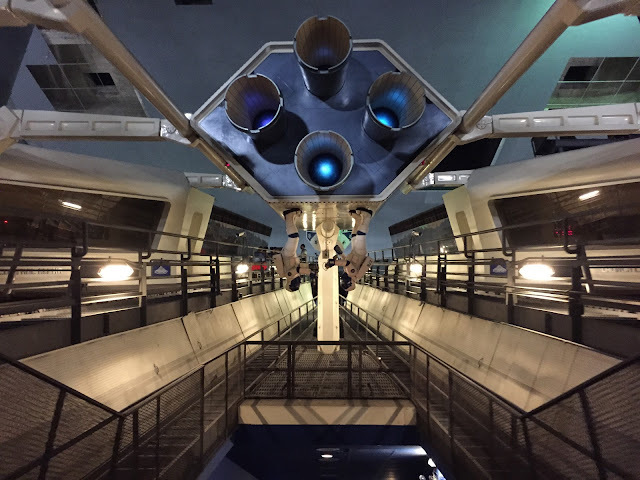 While riding the PeopleMover today, we got an interesting view inside Space Mountain. Since the coaster went down for technical difficulties, the lights came on inside this normally dark attraction. This shot was taken between the lift hills. If you zoom in and look closely, you can see there is a cast member standing at the top of the left track getting ready to help guests evacuate that rocket. Liberty Square is situated along the "Rivers of America" in the section that represents the Hudson and Mississippi. 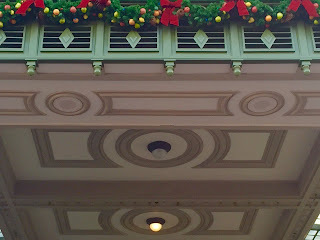 I took this picture in the area between the Haunted Mansion and Liberty Square Riverboat attractions. 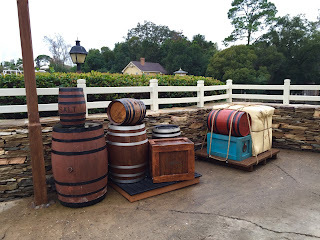 The river was a primary way of transporting goods during colonial times, and these were some of the things you'd expect to see loaded onto riverboats. It you look closely at the red barrel atop the blue crate, you'll see a number 71 painted on it. 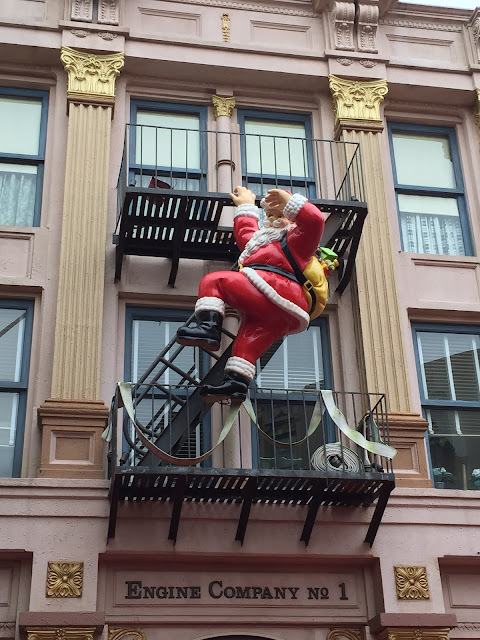 We can only assume that this was purposely done as a tribute to the year the Magic Kingdom opened. It is time for another "Way Back Wednesday" side-by-side comparison. This is the view from the top of Swiss Family Treehouse looking toward Cinderella Castle. The top picture is one that my dad took in 1977, and the other one was taken by me last week. 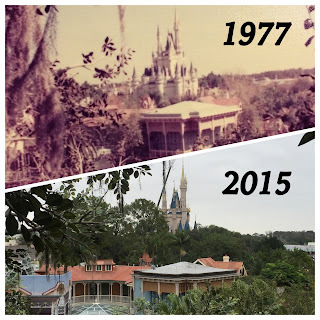 You can see that the trees between the treehouse and the castle have grown quite a bit in the last 38 years. There was actually a more complete view of the castle in the old days. The PeopleMover is definitely one of my favorite attractions. It is relaxing yet fun, and it is a good way to experience a nice breeze on a hot day. 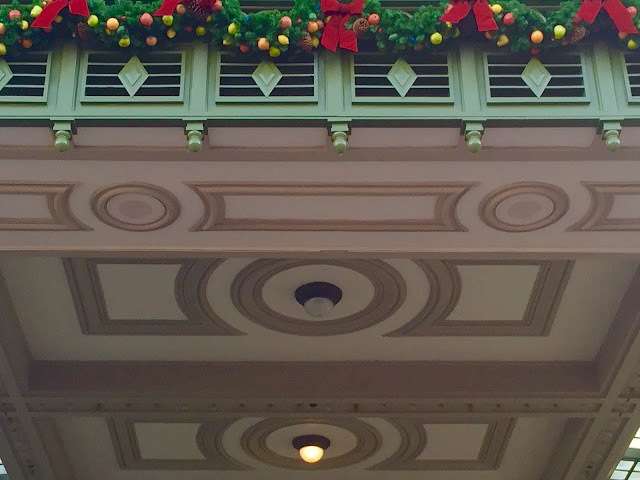 Today, I was waiting for my tour guests near Carousel of Progress when I noticed this view. The sky appeared to be the same color blue as the "train" going by. One of the must popular areas in all of Walt Disney World is Princess Fairytale Hall in the Magic Kingdom. This is mostly due to the incredible popularity of the movie Frozen, and the fact that Anna and Elsa are there to greet guests on a daily basis. 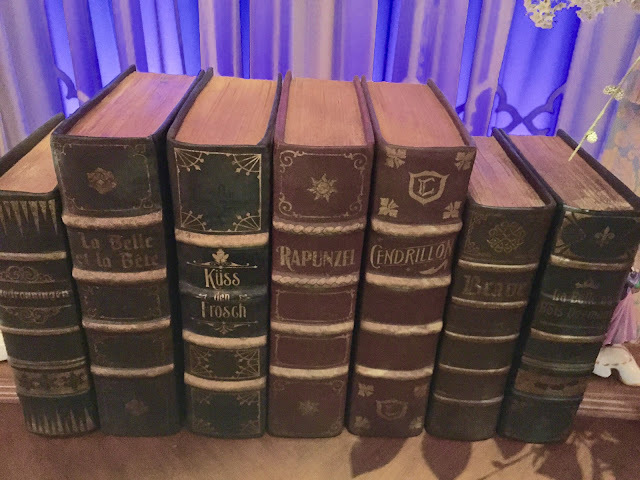 On a table in between Anna and Elsa are the fairytale books, with the titles written in the language where that story takes place. I took this picture while visiting this duo a few weeks ago with my tour guests. A few days ago, I climbed into a "race car" at the Tomorrowland Speedway and went for a drive. This shot was taken during the first turn, shortly after the ride begins. These cars move at a whopping 7.5 mph utilizing a 9hp Briggs and Stratton lawnmower engine. 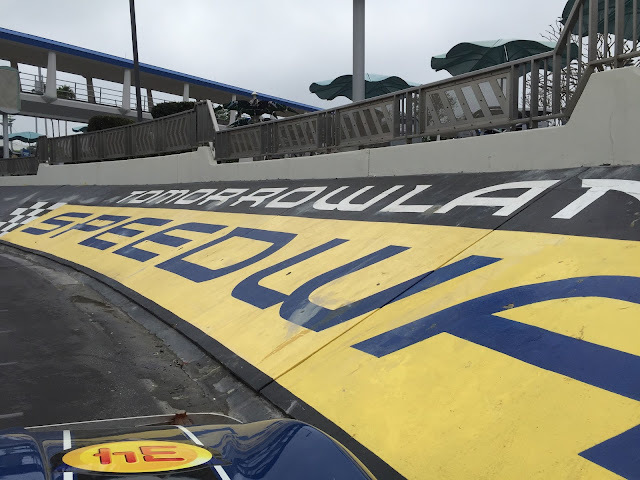 The Tomorrowland Speedway is the only attraction in this land from opening day in 1971. 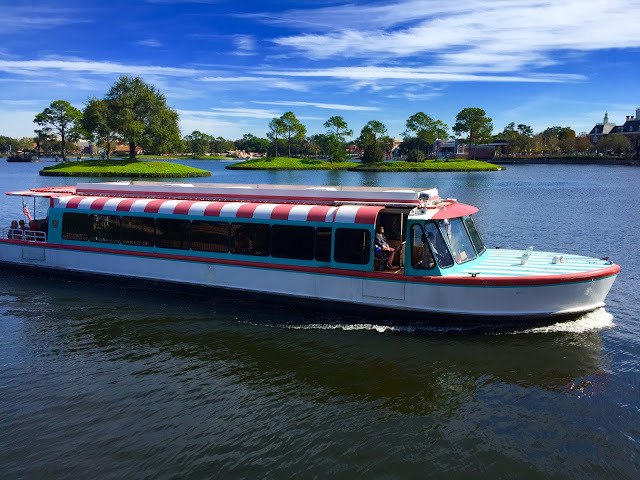 This past Thursday marked some special birthdays at Walt Disney World. Both Space Mountain and Carousel of Progress turned 40, and The Seas at Epcot turned 29. 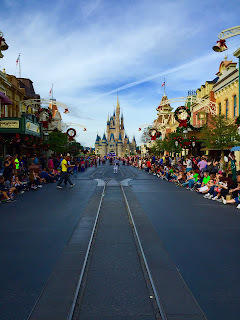 I visited the Magic Kingdom that morning to visit the two Tomorrowland attractions on this special day. 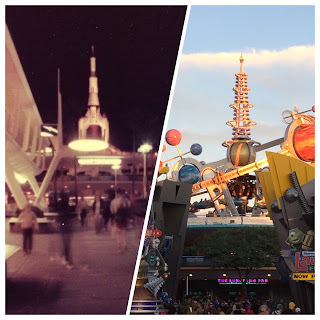 Although the Carousel of Progress opened in this park on January 15th, 1975, it officially debuted at the 1964 World's Fair. I took this panorama shortly after enjoying the classic show. 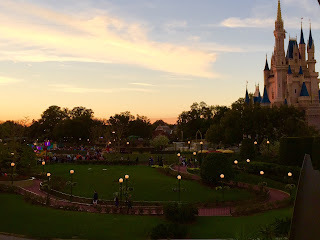 While waiting for my tour guests near Small World this afternoon, I noticed this view as the sun started to set. 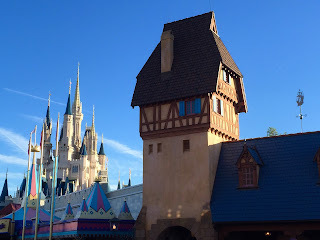 I liked the way the castle and Peter Pan buildings looked at that hour. This is a very "quiet" looking shot, but if I had lowered the camera, you would see hundreds of people and a very busy Fantasyland. If you look carefully on the ride side, you can see the weathervane in the appropriate shape of a pirate ship. I had fun playing with my long exposure app again today. 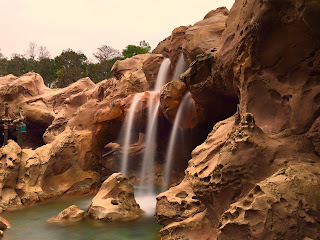 I set up my mini tripod on some rocks in the FastPass queue for the Under the Sea attraction at the Magic Kingdom. This shot of the rock work was set to a 16 second exposure, which really smooths out the waterfall. I hoping to try this technique out with fireworks next. For this "Way Back Wednesday" I decided to do a side by side comparison. On the left is a 1977 photo of the Star Jets that was taken on our family vacation. On the right is a shot of the current Astro Orbiter that I took a few weeks ago. 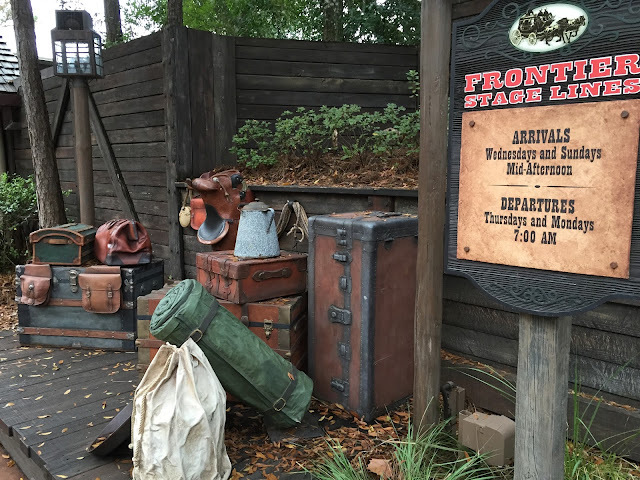 This is one area of the park that has changed quite a bit over the years. You can see how "white" the area was when the park first opened and how colorful it is now. Today, I decided to try out a fun new iPhone app that creates "light trail" shots like you'd get when using a long exposure setting on an SLR camera. I set up my mini tripod on the railing near the last turn of the Tomorrowland Speedway at the Magic Kingdom, and set the app to a 16 second exposure time. After several attempts, I was finally able to grab this shot with all four lanes full of cars. Although their top speed is only 7 mph, they certainly look a little faster using this technique. I took this Fantasyland panorama a few weeks ago from just outside the back of Cinderella Castle. At the center of the shot is one of the most classic attractions in the park, Prince Charming's Regal Carrousel. It is the oldest ride to be found in Walt Disney World as it is approaching its 100th birthday. Fantasyland embodies what the Magic Kingdom is all about, as it is fun for kids of all ages and those who are young at heart. 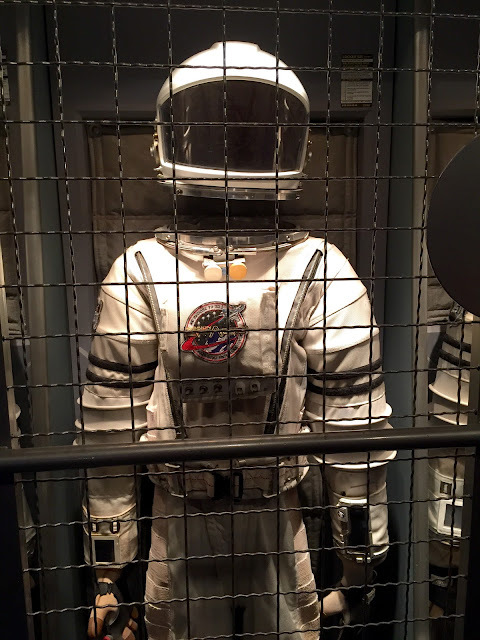 Mission Space at Epcot is one of the most unique theme park attractions in the world. It gives guests the opportunity to choose between two versions, depending on how brave they are. It is also the only attraction in Walt Disney World that contains "sickness bags" near each seat. I took this shot yesterday, while in the briefing room prior to boarding the X-2 Deep Space Shuttle simulator. 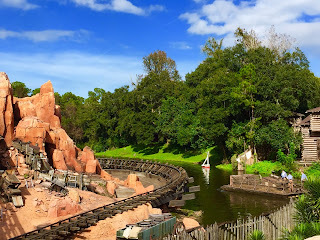 The area around Thunder Mountain is a place where I have taken many photos. 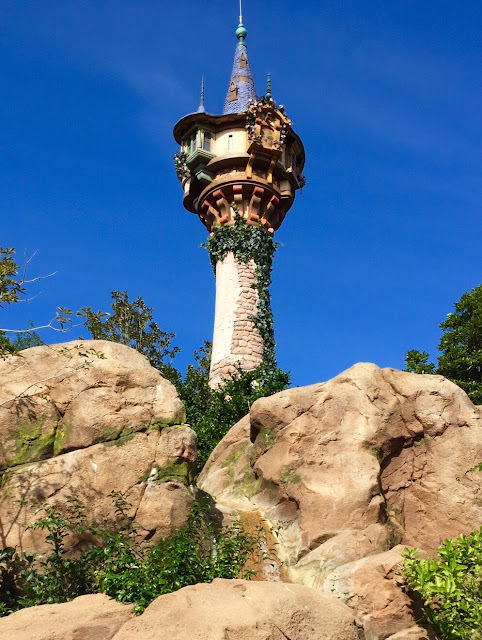 This attraction against a blue sky backdrop can be very inviting. 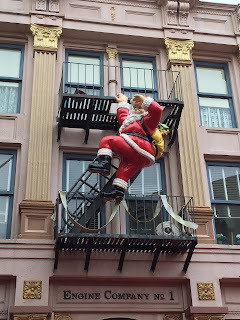 Today, I saw a sight that I don't remember witnessing in the past. There was a Tom Sawyer raft heading up the river. These rafts cross back and forth all day long, but it is rare to see one off its normal route. I can only guess that it was being brought backstage for maintenance. The Land pavilion at Epcot has seen several changes since opening in 1982. Without question, the most popular change was the addition of Soarin. However, there were two other attractions that were previously in that area before the "flight simulator" opened in 2005. The Kitchen Kabaret was there from Epcot's opening day until this date in 1994. On January 3rd, 1994, this audio-animatronic presentation closed to make way for a new show called Food Rocks. Finally, on May 5th, 2005, Soarin' took over and the rest is history. 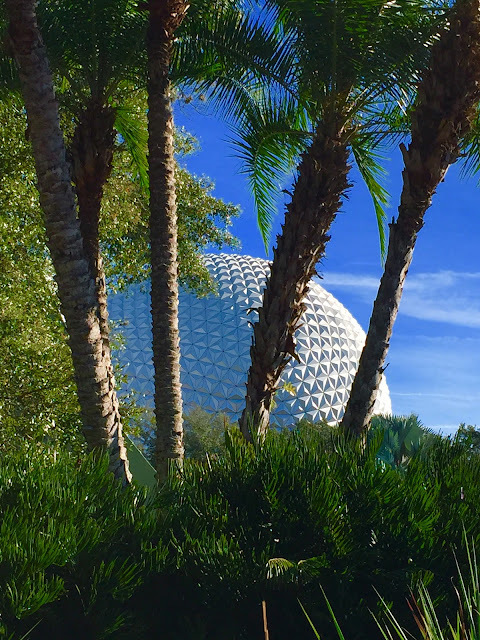 I took this panorama today, while giving a tour of Epcot.